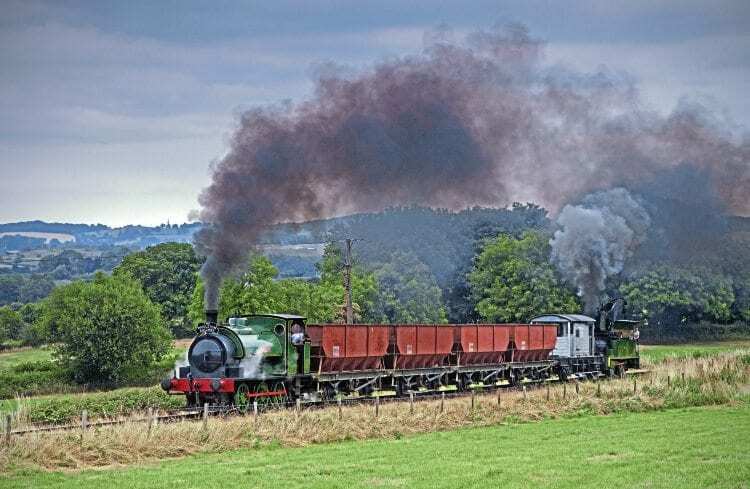 A SPECIALLY created ‘fire train’ and fire safety procedures implemented by the Foxfield Railway enabled the Staffordshire line’s July 21-22 Summer Steam Gala to proceed virtually incident free in spite of the ongoing heatwave. Star billing was shared between former Brookes Chemical Company, Halifax, Hunslet 0-6-0ST Brookes No. 1 (2387/1941), visiting from the Middleton Railway, and the Vintage Carriages Trust’s Haydock Foundry 0-6-0WT Bellerophon, which was making the final appearances of its current boiler certificate that weekend. Both were in action working coal trains up the bank from Foxfield Colliery and, thanks to the presence of the ‘fire train’, these departures lacked none of the drama for which the railway’s galas are renowned.